Myles Lavan is using analytical techniques from the natural sciences to solve a long-standing problem in the history of the Roman empire. Rome’s unusual generosity with its citizenship is often cited as a key factor in its success as an imperial power. The incorporation of outsiders figures prominently in the mythical histories that Romans wrote of their own early history, such as the famous story of ‘Romulus’ asylum’ on the Capitoline hill. The first new citizens were freed slaves (where other cities relegated ex-slaves to the status of resident aliens, the Romans made them citizens) and Italians, as the Romans enfranchised immigrants and annexed some conquered territory. But Roman citizens remained a minority of the Italian population up to the first century BCE, when a war between the Romans and their Italian allies – the so-called ‘Social War’ – convinced the Romans to extend citizenship to all of Italy south of the Po. The next step was the enfranchisement of the provinces. Increasing numbers of provincials became Roman citizens by serving in the Roman army, holding magistracies in their own communities or by a special imperial grant to themselves, their family or their city. This process reached its culmination in 212 CE when the otherwise infamous emperor Caracalla granted citizenship to all free inhabitants of the empire. 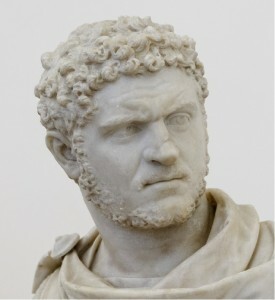 The problem is that we still have a very poor sense of the scale of enfranchisement before Caracalla’s grant. Research to date has focussed on identifying Roman and non-Roman names in inscriptions from the provinces. That is a useful way of getting some sense of local differences in the level of enfranchisement, but it has failed to produce a conclusive picture of the situation overall. Some scholars think citizenship was widespread by 212; others think it remained relatively rare; no one will commit to even an approximate percentage. Most probably think the level of enfranchisement is unknowable given the current evidence base and have resigned themselves to writing the social and political history of the empire without a firm understanding of this important process. This project aims to break the deadlock by taking a new approach. It starts from the fact that we know the mechanisms by which enfranchisement worked, such as service in the Roman army. For each mechanism, we can identify the key parameters that will have governed the rate of enfranchisement. In the case of the army, for example, these include the size of the army, the average length of service and survival rates. It is then a relatively straightforward matter to build a mathematical model that will calculate the progress of enfranchisement based on any given set of values for those key parameters. The challenge is how to deal with the fact that many of the parameters are themselves highly uncertain. The sheer number of uncertain variables involved in calculating the overall level of enfranchisement might seem to doom the analysis. The solution is to borrow a technique from other fields with more sophisticated methods for managing uncertainty. Traditional modelling techniques in ancient history are deterministic, i.e. they produce a single ‘best estimate’ for the unknown quantity based on inputted most likely values for all the component parameters. More sophisticated approaches to uncertainty rely on stochastic models which allow all the parameters to vary simultaneously. 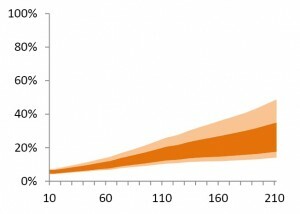 Both inputs and outputs are expressed as probability distributions rather than discrete values. This makes it possible to estimate the likelihood of all possible levels of enfranchisement based on what we know about the key parameters driving the spread of citizenship. Preliminary analysis suggests that the range of likely values will turn out to be usefully narrow, so the approach promises to produce the first robust quantification of the progress of enfranchisement up to Caracalla’s grant. The project draws on quantitative skills acquired during a previous career in business and finance and is an example of how an interdisciplinary perspective can offer new and powerful insights into old problems. 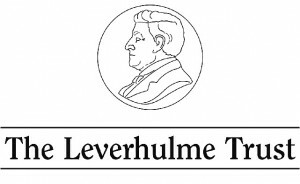 This project is supported by a Leverhulme Trust Research Fellowship.